Wash the minced meat well in a fine strainer so that the blood drains off. In a pressure cooker and heat it on full flame.Put oil in the cooker wait until it heats up.Then add onions fry for 5 to 8 minutes. Now add ginger/garlic paste saute for 3 minutes.Now add the minced mutton mix well. Add turmeric powder,red chilli powder,garam masala powder and salt to it.Saute for 5 to 7 minutes.Add 1 cup of water mix well. Cover the lid and put on the whistle.Pressure cook for 4 whistles. Once the pressure is off,open the cooker and add coriander leaves,then cook till the water is evaporates.Kheema should be dry. 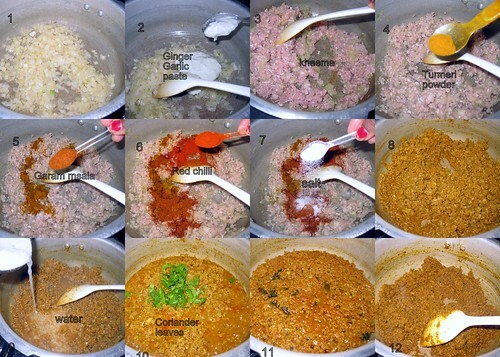 When kheema is cools down make a small size balls and keep it aside. Pressure cook potatoes for 3 whistles until they are soft.Peel the skin and mash them nicely while they are still warm. 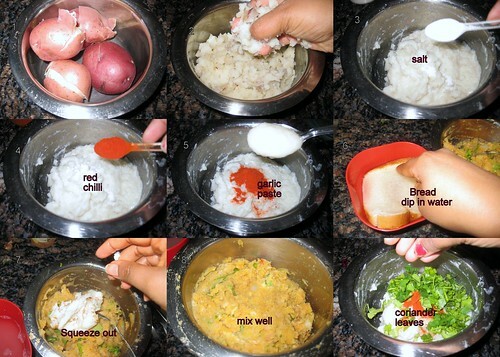 Add red chili powder,turmeric powder,ginger/garlic paste,salt and coriander leaves. mix well. Dip the bread slice in water and remove it immediately and squeeze out the water thoroughly and add it to the mashed potato. mix together like a dough. Beat egg in a bowl and keep it aside. 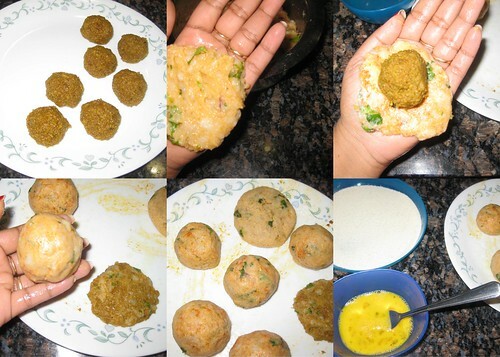 Grease your palms and take a big lemon sized ball of potato dough and flatten it a bit and stuff it with kheema ball and seal it from all sides and flatten it to a round shaped patty. Repeat the process until you make all the patties. Heat enough oil in a pan to deep fry. U can dip in a sooji . 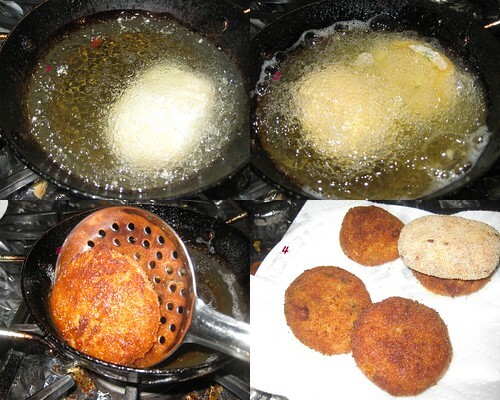 Drop the cutlets carefully into hot oil and fry till golden brown. Serve hot with tomato sauce or chutney of your choice. am coming there :) nice preparation divya..
Wow. 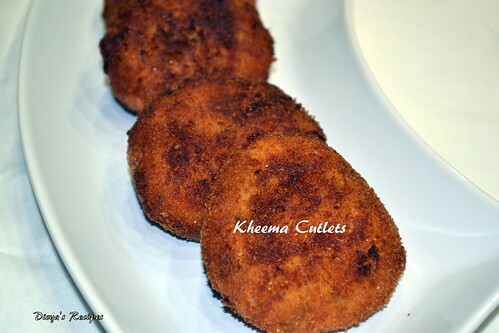 Yummy cutlet. Send me parcel. Wow so lovely the stuffed cutlet looks. Naanum varava..Superb preparation.Yummy, mutton would taste great..
A very different version from mine Divya, liked the recipe and very good step by step clicks. you seem to have lot of patience dear. well done. 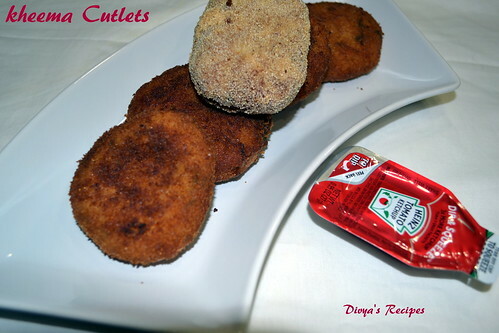 Love cutlets have not had them in a long time and now you are making me hungry Divya! 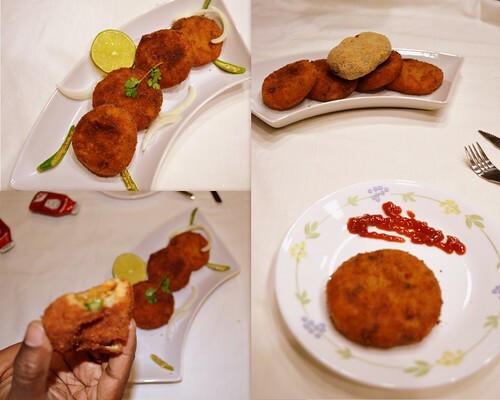 very perfect and tasty cutlet..
Lovely preparation with eye catching pictures..Delectable cutlets..
Divya these must be very delicious. 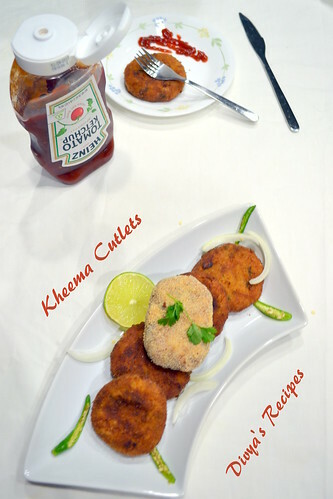 Delicious cutlets sure going to tea time a great treat. 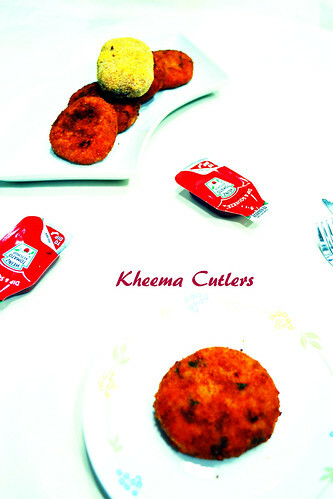 wow... kheema cutlets look fantastic... mouth watering!! These patties look absolutely irresistible! So funny I use the same ketchup! Looks delicious. Please pass me some Divya. Thanks a lot Divya for visiting my space and leaving your lovely comment !!! The cutlets look awesome. Thanks for visiting my blog!!! 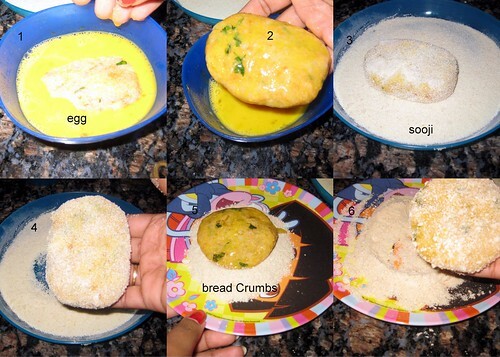 wow love the pics,looks so tempting...will surely try this with chicken..
ohh wow this should be a winner recipe. lovey texture and that keema inside is like a great surprise once in dig in. perfect recipe. between am having a blog giveaway (RS.1500 flipkart gift voucher) at my page. please send in any soup or hot beverage recipe and link in to this post. you can even relink and repost one of your old recipes to this. Oh Divya! I can only imagine how tasty these cutlets would be. Absolutely delicious, tempting clicks too!